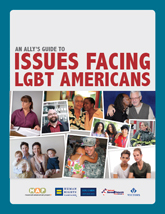 An Ally’s Guide to Issues Facing LGBTQ Americans is a primer for allies that introduces the major areas in which LGBTQ Americans face challenges in fully participating in life and provides a summary of what advocates are doing to work for change. The guide was authored by the Movement Advancement Project (MAP), Human Rights Campaign, Log Cabin Republicans, National Stonewall Democrats and the Gay & Lesbian Victory Fund and Institute. This report incorporates information current as of December 1, 2012. Download a PDF version of the full report.